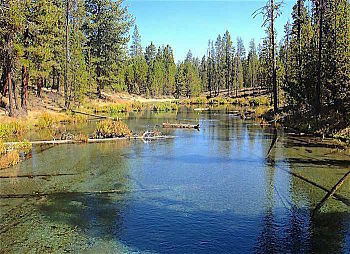 Spring-derived streams are fairly common along the eastern slopes of the Cascade Range in Central Oregon, including the Metolius River, Cultus River, Quinn River, Brown’s Creek and Fall River. The combination of heavy precipitation along the Cascade crest, permeable volcanic bedrock, plus groundwater flow serves to recharge all of these spring-fed streams. But Fall River has been the most extensively studied as a local indicator of climate change — besides having a delightful hiking trail along its banks to explore. bedrock reappears in Fall River as spring-fed streamflow. Since the Fall River watershed has no other surface water flow, 100% of its discharge is derived from this groundwater and rainfall infiltration. This makes the variations in its streamflow an excellent indicator of hydrological conditions throughout the Upper Deschutes River basin. In fact, when the variations in streamflow at Fall River are compared with water table fluctuations in an observation well near Sisters, Oregon — nearly 40 miles away! — they’ve shown a very strong correlation over the 40 years from 1960-2000 (chart above). 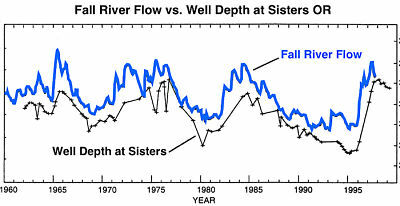 Stream-gage records indicate that Fall River has little seasonal variation; its average monthly flow only varies about 5% from its average annual flow. This contrasts with a runoff-dominated river like the Upper Deschutes at its headwaters, whose monthly flow varies by nearly 50% from its average annual flow (in green, chart below). On the scale of decades though, Fall River’s flows do respond to longer-term wet/dry cycles and snowpack trends (in blue below). Most striking is the 40% overall decline in the long-term average flow of Fall River in the six-plus decades since 1950. 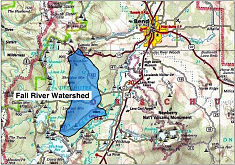 This has been matched by a corresponding fall in groundwater tables throughout the Upper Deschutes Basin. Most of these declines are attributed to a warming climate, as precipitation in the High Cascades shifts more to rain and less to snow, reducing the volume of groundwater infiltration and discharge to spring-fed streams like Fall River. One of the best ways to experience Fall River is to hike all or part of its 3.3-mile riverside trail. Open most of the year, except in the snowy winter months, the trail is accessible at four different points along State Road 42 (aka South Century Drive), about 28 driving miles southwest of Bend. The hike can be started from its west end, its east end, or at one of two access points in between, and can cover all or just part of the entire trail (see map download below). Perhaps its most remarkable feature is Fall River’s headwaters springs, found at the trail’s west end behind the Fall River Guard Station, just off Road 42. The old Guard Station is not open to the public, but can be rented for overnight use from the Forest Service. About 100 feet south from the parking area, walking around the railed yard of the Guard Station, one comes to the gushing, grassy-banked springs. Look for tiny white orchids and water ouzels around these springs. Returning to the parking area, the unsigned Fall River Trail begins near the vault toilet on a dirt road leading east. At first, the trail is over a broad bench above the stream through old-growth ponderosas. At 0.9 miles, just past a picturesque footbridge over the river at the Fall River Campground, the trail drops down to riverside through thick stands of lodgepole pine. For the next couple of miles, the trail follows the stream east, sometimes along its banks and at other times away from it — but it almost always has a view of the river. Look for monkeyflower and arrowleaf butterweed growing from old logs in the stream, with showy yellow blossoms in early summer. For some stretches, the trail marks the boundary of controlled burns in the upland ponderosa groves above the river. At 2.4 miles, the trail passes near a paved parking area on Road 42, which can make a good turn-around point, or the end/start of the hike if one’s group has two cars. The trail continues east for another 0.9 miles to its terminus at a second parking area on Road 42 — but this section is mostly through thick lodgepole stands and is perhaps the least scenic.